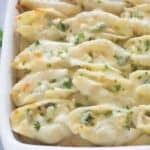 Chicken and Broccoli Alfredo Stuffed Shells include tender pasta shells filled with a cheesy shredded chicken and broccoli mixture and smothered in an easy homemade alfredo sauce. There are two things I can’t get enough of during my pregnancy so far: cheese, and pasta! I can’t tell you how many times my sweet husband has made spaghetti for me, and I pretty much lived off of quesadillas during my first trimester. I love that it’s a meal my kids will always eat happily, without me having to beg them to finish their dinner. 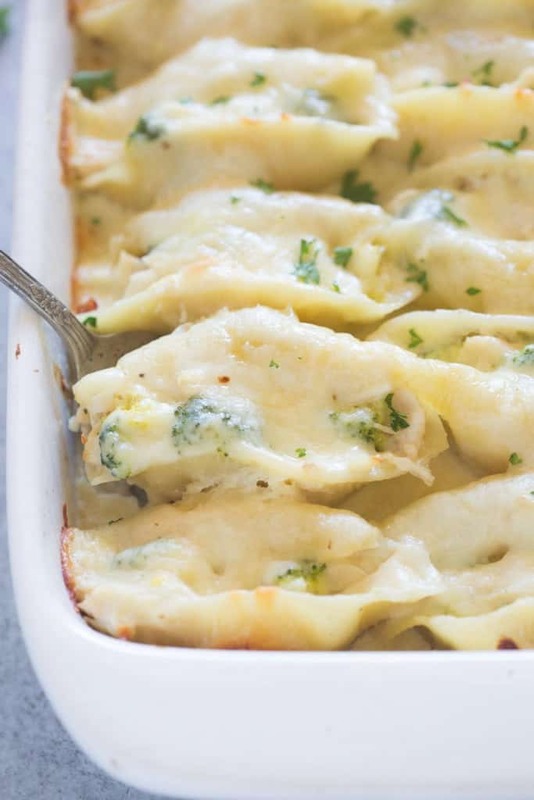 My husband was a particular fan of these Chicken and Broccoli Alfredo Stuffed Shells. The name pretty much says it all. You can whip these up even faster if you use a rotisserie chicken. (Thank you Costco, for your amazing 5 dollar rotisserie chickens that I use in so many meals!) Hope you all enjoy this yummy pasta as much as my family does! This recipe makes for an excellent freezer meal. Assemble the dish following the recipe directions but don’t bake them! Consider using a disposable container or aluminum pan. Once the meal is assembled, cover it with a layer of plastic wrap and then a double layer of aluminum foil. Freeze this meal for up to 2 months! When your ready to enjoy it, remove it from the freezer and allow it to thaw in the fridge for 24 hours. remove the plastic wrap, cover it back up with tinfoil, and baked 45 minutes or until warmed through and bubbly. Remove the tinfoil for 15 minutes before it’s finished baking to allow the cheese to get bubbly! Cook pasta according to package instructions, just until al dente. Drain from water and lay out on a large dish to cool, so that they don't stick together. Combine butter, garlic, heavy cream and milk in a saucepan over medium heat. Bring to a simmer. Beat egg yolks in a small bowl. Add a spoonful of the hot milk mixture to the eggs, stirring to temper the eggs. Repeat with several more spoonfuls. Slowly add the egg mixture to the saucepan and stir to combine. Remove from heat. Stir in Parmesan cheese and mozzarella. Season with salt and pepper, to taste. 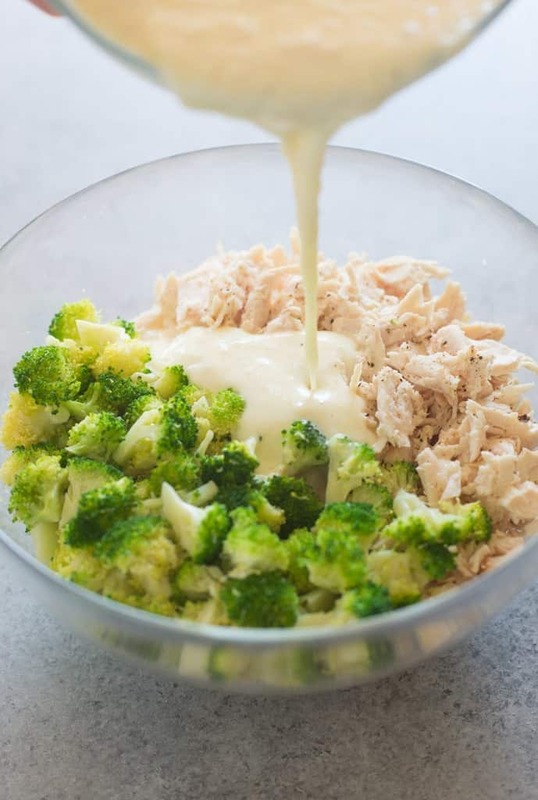 In a large mixing bowl, add chicken, broccoli, and 1/2 cup alfredo sauce. Toss to combine. Add a spoonful of alfredo sauce to the bottom of a 9x13'' pan. Fill shells with a large spoonful of chicken and broccoli mixture and place in prepared pan. 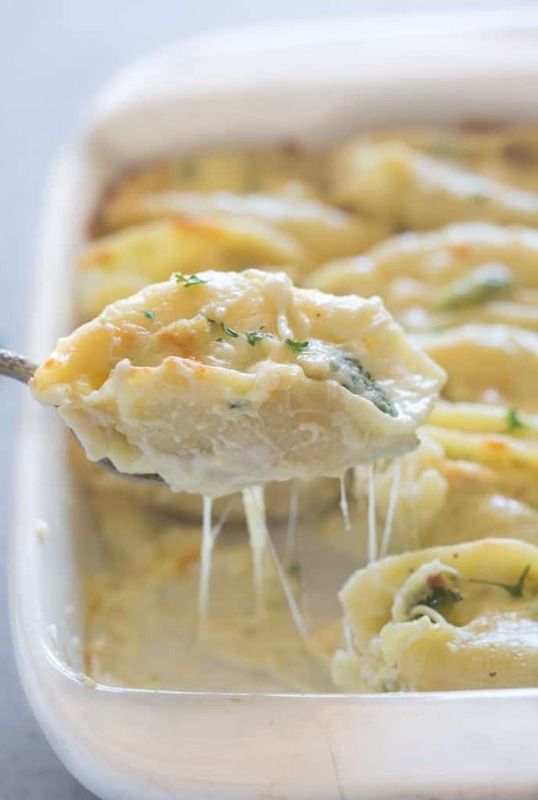 Pour remaining alfredo sauce evenly over the shells. Sprinkle with remaining 1/2 cup mozzarella cheese. Bake at 350 degrees F. for about 25 minutes or until warm and bubbly. Next time try lasagna stuffed shells or pizza stuffed shells! I make this for my family and they love it. The nicest thing said about this dish was a compliment that I got at church (I cook every Wednesday night for my church family). This is the only recipe that has gotten several “This is my favorite dish” compliments. I now pass this compliment on to you. Love to make this but I don’t want use whipping cream, what can I use instead? Chilly Wisconsin-Italian night up here. Looking forward to the casserole (and a glass of Chianti)! 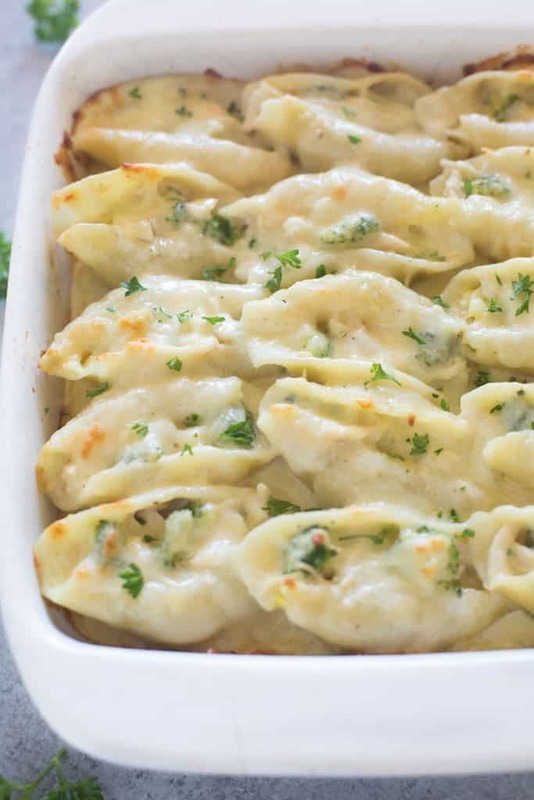 I use the Alfredo sauce recipe and make the stuffed shells carbonara style. Bacon and peas. Mmmm mmmm! I liked it. Hubby thought it was bland so I added some extra garlic powder, onion powder and pepper at the end which really helped.